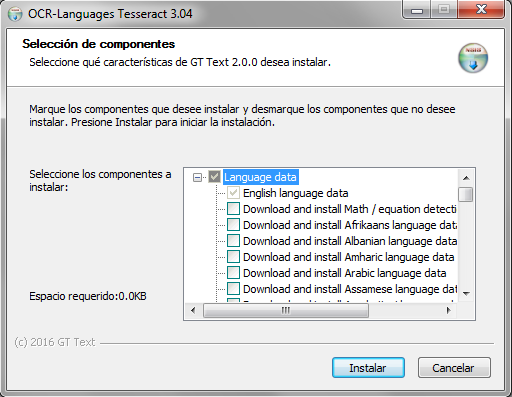 Since version 2.0.1, (go to the lastest version) you can download GT Text from the download page. Simply click on the button of the version you need 32 or 64 bits, and the program will start downloading. Can GT Text recognize text in German, Japanese, or Mandarin? 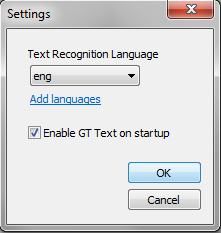 Of course, GT Text can recognize text in German and many other languages. Why does the text appear with added line breaks in my recognition? Windows default message box uses additional line breaks. You just press copy and when pasting, your line breaks will be exactly as the original text. (or almost). How many languages can GT Text recognize? A lot (close to 100 actually since version 2.0.1). You just have to download the language pack you want from “Add languages” button on the toolbar and select the OCR recognition language that interests you. From the window that appears click install, wait a moment, and you are ready to go! How I can indicate to GT Text the language I want to recognize? It’s easy, just go to FILE> SETTINGS and if you already have downloaded the pack of language that you need, just select it using the dropdown list, but if you have not already, you must install it by clicking the “Add languages”, as described in the previous section. Is GT Text able to extract text from an image? Of course, GT Text software for text recognition, can extract text from any image. Can GT Text extract text from a web? Yes, since version 2.0.1, so we must simply click on the button “Copy text from screen area”, GT Text is automatically minimized and then appear the tool to select the area of the screen that you want, you make a box over it and ready, text copied to the clipboard. What operating systems does GT Text support?